Hi friends! I'm SO sorry that my post is late. Brady is sick. AGAIN! He managed to catch a cold right on the tail end of all of us getting the stomach flu. I am EXHAUSTED! Ok, enough about me! Welcome to my stop on the Love My Tapes Christmas Blog Hop! You should start on the Love My Tapes Blog. 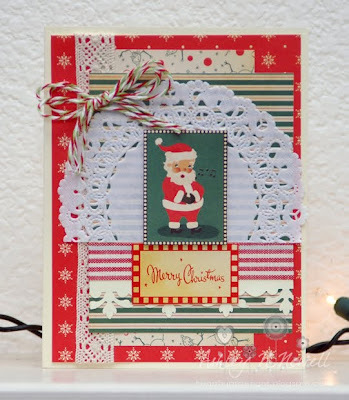 The LMT team will be showing off fabulous Christmas projects using Love My Tapes! GIVEAWAY ALERT! Leave a comment by Tues Dec 13 by 8pm EST to be entered to win an awesome LMT PRIZE PACK! Winner will be announced on the LMT Blog on Wed. There's only 5 designers on this hop so it will be SUPER fast! Here's my card for this hop. I decided to use some Beige Lace Tape and Red Striped Fabric Tape on my card. Of course, I adhered everything together with a LMT Double Side tape runner. The paper is from Cosmo Cricket's Dear Mr Claus and I accented with a doily and some Holiday Divine Twine. Your next stop on this blog hop is GIOVANA! Happy hopping! Here's the whole blog list in case you need it! Hope your boy gets better soon! Love the lace tape!!!! Fantastic card Ashley!! Love it very much. Hope your little one feels better soon. I love the lace tape! Very cute card, the doily adds a great touch too! Best wishes for a speedy recovery for your little boy! Beautiful Card! Thanks for the Inspiration! Hope you little one feels better, I know how it can drain a mamma! Cute card! Love the added touch of the twine bow! So festive! Live the spiky an that red striped tape! Thanks! Oh poor everybody! And you manage to keep creating beautifully on through it all! Here's to hoping it is the tail end of all tail ends! I love your card and all the tapes you used! Hope your family is all healthy soon! What a super cute Santa card! Loving all the details on it! I hope your little one gets better quick! Hope your guy feels better soon! Super cute card! Love this Miss Ashley!!! TFS!!! Love the slightly vintage feel to this card. And that lace tape!!! WOW! Health to your family! I hope you're all in the pink before Christmas. This is just adorable! Hope your boy is better quickly! Who doesn't love Twine?! Lovely choices and beautiful composition. Hope the little guy feels better soon. such a sweet card! hope the sickies go away soon! Cute card! The lace and fabric tapes are great. Fun layers and use of papers! Very pretty card, love the tapes!! That peppermint twine is also awesome!! Gorgeous Card! Love the vintage look of it. Hope your little guy gets 2 feeling better real soon. Love seeing the ideas for using these tapes...especially like the lace tape! Very pretty! Love your card and that lace tape! Hope your little boy is feeling better. This is really cute card! I hope your little one is doing better today! I love that Santa, awesome card! SUPER SUPER cute--love it! Said so the other day--and I still love it today:) YOU ROCK!